From time to time runaway Amish buggies make news, though it’s not something you come across often. However the past several days saw two such incidents reported. Luckily, no one was hurt in either case. But runaway horses have caused severe accidents in the past. The second incident in particular seems like it could have been especially bad. More on that below. LANCASTER COUNTY — A runaway horse dragging an Amish buggy damaged several cars in Clay Township Friday morning, according to Ephrata Borough Police. Police believe the horse and buggy were waiting outside a Sharp Shopper store in Clay Township when the horse got free of its tether and ran off. No one was inside the buggy at the time, police say. The horse ran free for about 1.4 miles, dragging the buggy behind it, police say. The buggy struck two parked cars, causing minor cosmetic damage, according to police. On Sunday in upstate New York, a potentially more deadly situation occurred when a driverless buggy got loose and headed the wrong way on an interstate highway. What made this worse was that it occurred at around 10 in the evening. 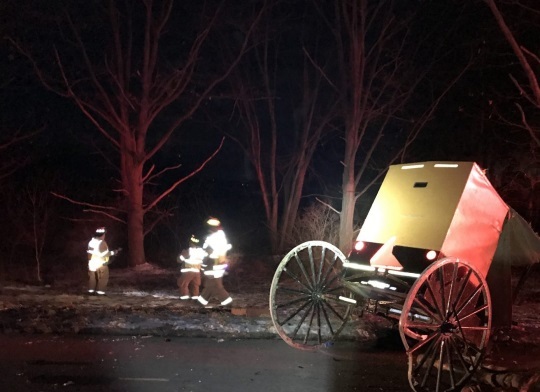 KENNEDY — An unoccupied Amish buggy that was traveling the wrong way on Interstate 86 was struck by a semi tractor-trailer Sunday, the New York State Police said. County dispatch had received several calls around 10 p.m. of the buggy in the eastbound lane of the interstate near the Kennedy exit. According to Capt. Eric Balon of the New York State Police, the buggy was traveling westbound in the eastbound lane when a 2014 Volvo semi, driven by 57-year-old Kevin Jacobs of Louisville, Kentucky, struck the horse head-on. The horse was killed in the collision. The owner, 44-year-old Emanuel Kurtz of Mud Creek Road, Kennedy, told troopers that the horse had run off with the buggy before he could get the buggy secured. These incidents remind us that although Amish buggies usually come out on the losing end of highway accidents, they do present their own threat, especially in cases when horses bolt. In one incident in 2017, a runaway horse pulled its buggy for 10 miles before being stopped, though luckily without causing anyone harm. That’s not always the case. A woman in Pennsylvania suffered a severe brain injury when an Amish horse got loose and struck the van she was driving in 2013. And in 2016 a driver was killed in Wisconsin when a runaway horse-and-buggy struck his car. Accidents happen and this is not a call to get horses and buggies off the road. It’s just a reminder that horses are animals and even though they may be well-trained, some can behave unpredictably. Horses don’t come out of a factory all running the same. Some need more training than others, and they have different temperaments. “You still always have wilder horses than some,” said one Amish woman in a WGAL video report on the 2013 accident. “And some that just don’t like to stop at stop signs.” It follows that it’s the horse-and-buggy driver’s responsibility to ensure road safety by driving road-worthy horses. Were the horses in these incidents reliable? Or was it just a freak occurrence – a case of instinct or fear kicking in that is possible anytime it’s an animal powering your vehicle and not a machine? There is no “road horse certification” requirement that I know of, and I don’t expect there will be. So this is something the Amish and other horse-and-buggy drivers have to continue to manage on their own. For the most part, that seems to be working, even though there is always the possibility of an animal behaving in an unexpected way. It seems buggy drivers should be able to minimize that – by using their good judgment to drive only horses that they can reliably control on the road. I am so disappointed that new drivers are not taught to respect horses while driving. On more than one occasion, while mounted, I have experienced drivers honking their horns or rushing up behind. Spooks even the seasoned horse. And, while hauling horses with a bumper pull, even the police came up and honked. The weight of the horses while in a trailer as well as their kicking was dangerous. I had to tell the police to shut off their lights and to back off. There are still hoof prints in the trailer door. Non Amish need to be taught what true horse power really is like before they can obtain a drivers license. The Amish/Mennonites who travel by way of hore and buggy commonly use saddlebred, standardbreds, Morgans, Friesens, Dutch Harness bred horses. Even the very best experienced horse people are misitifed as to why a well trained, sound horse might suddenly, and without warning break away. The horse was obviously spooked by someone, or some thing. A smell. sound, color, or low ground motion can have them immediately breaking away. Things us humans cannot see or hear have a horse reacting. i have known the soundest of horses to suddenly become frightened. Truthfully I don’t know how these accidents are not more common; most well traveled roads are not designed for horse and buggy commute, and riding in one is plain dangerous. When people begin to see just how hard it is for a horse to live the life it lives with the Amish, they might feel some sympathy and be more careful of a horse-drawn buggy. That horse either was spooked by something, or it decided to try and make a run for it! I’m glad it wasn’t hurt. I agree and disagree with your post. Horses have been serving humans for years in all aspects. I have seen wealthy high school girls board their well-bred horses at their home in their resident backyards, and proceede to haul them to training rings and horse showes for horse competition from state-to-state. No one thinks anything is wrong with this. What they don’t know is that the girl goes away to college, leaves the horse in her back yard to live in a one-horse shed, and where both her parent’s work professional jobs and never even consider this lone horse,! The only ones the horse sees is the truck that drops off the hay/feed, and the “gardener” who has made an arrangement with the parent’s to feed the horse! That’s neglect. These horses areis lonely, don’t see a field to graze, theres no interation whatsoever, subsequently health issues comence. Then they put the word out, “please inquire if you can exercise my horse”. Second/third year in college, the horse is up for sale. Now take a farmer — who has a farm and uses draft horses for work [Amish, Mennonites, and farmers with under 80 acres of land]; that use draft work horses that were bred to work. I can tell you the daily interaction and exercise keeps them fit, sound, and happy! The are constantly being cared for, and vet checked. It is truly good for them. And have I seen abuse? Seldom, and we all speak up. But like I stated, it’s the paved traveled-by-cars/trucks/campers many of us horse lovers object to, and not the horse pulling a buggy that is wrong. Our roads are not designed for horse and buggy transportation, and drivers by and large do not yeild to buggies! Hck they don’t yeild to anyting! Moreover, a horse can simply [and for no apparent reason] get spooked or bolt, no matter how sound he/she is. And it happends more than occasionally. Gary, that was honest and well said. And the message loud and clear! People’s behavior behind the wheel, where the Amish lives were never thought common sense, applies to everyone. Unfortunately., Law enforcement is making the Amish miserable. Long Story short use Initiatively, read the Previous made by other people.